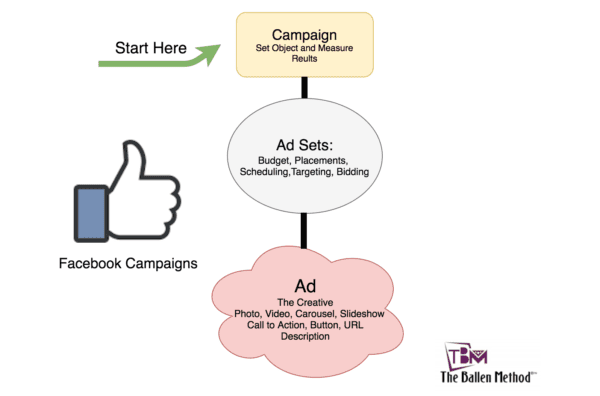 Getting started with Facebook marketing can be a daunting task. You always want to make sure that you’re getting the most bang for your buck whenever you’re paying for ads. With this tutorial, you’ll be well on your way to generating more traffic with Facebook ads. There are various ways that you can generate traffic with your Facebook ad based on the results that you’d like to create. You’ll want to create a different ad for each result that you want to generate. The possible results include: Page Post Engagement, Page Likes, Clicks to Website, Website Conversions, App Installs, App Engagement, Event Responses, and Offer Claims. To get started with Facebook ads, log in to your main Facebook account. On your sidebar there’ll be a link that says “Create Ad” or manage ads if you are already running ads. You can also click here to find the Facebook Ad Manager. Click on the “Create Ad” link and you’ll be brought to a page where you can select which results you want to buy traffic for. Let’s start by generating some website traffic. On your ad, you may want to test up to 6 images. Each image that you upload will create a different ad in your “Ad Set”. An “Ad Set” is a set of ads that are similar in terms of demographic or other important criteria that you’re targeting. After your campaign starts, you can monitor how audiences respond to the different images. Facebook recommends a pixel size of 1200 x 628, so you’ll want to optimize your images to look aesthetically pleasing at this size. Upload 2-6 images to test. With any advertising campaign, you’ll want to have a test budget of around $25 – $300 to test your traffic and optimize for better quality traffic. After your test run you can choose the best performing images, and cut the others to optimize. Scroll down to the “Text and Links” field. Targeting the appropriate audience for your brand is the most important part of any marketing campaign. There are people whose entire careers go into this very skill. 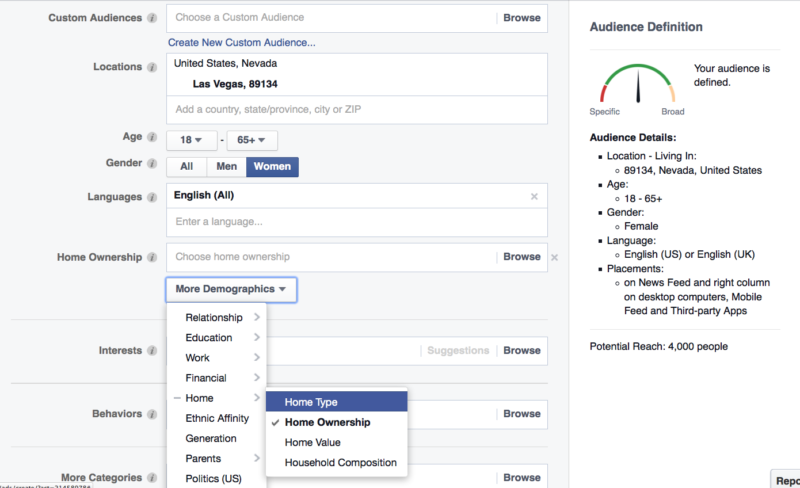 In Facebook, you can target your audience by Location, Age, Gender, Language, Interests, Behaviors (what the users browse online and on Facebook), Categories, and Connections (what pages they like, who they are friends with, etc.). We’ll expand on this topic in a future article, but do know that the more targeted your ads are, the more quality traffic you’ll receive. Scroll down to the “Account and Campaign” field. Here you can choose the Country, Currency, and Time Zone you’ll be running your ads from. You can also verify and edit the campaign you’re running, and name the “Ad Set” that the current ad fits in. You can set a daily budget of any amount based on how much you’d like to spend each day. For the test run, I’d recommend starting out running a third of your test budget each day for 3 days.You can also set a lifetime budget of any amount based on how much you’d like to spend for as long as your ad is running. Choose a continuous schedule, which will run your ad continuously until your budget is spent. Alternatively, you can chose a start and end date, where you choose when your ad starts and stops running. Scroll down to the “Bidding and Pricing” field. Here you can choose how you want to spread out your ad spend and who your ads will show to. With the “Bidding” options, you can either optimize for clicks, or optimize for impressions. If you choose to optimize for clicks, your ad will show to people more likely to click on your ad. If you choose to to optimize for impressions, your ad will be shown to as many people as possible based on your audience targeting. If you optimize for clicks, the “Pricing” options will determine how much you spend on each click. You can let Facebook automatically choose this for you, or your can name your own price. There’ll be a “Suggested bid” reminder under the text field that shows you how much your competition is bidding. Make sure to adjust your bid so that you’re within the suggested bid range or higher in order for the ad to show to your audience. If you optimize for impressions, you’ll choose to pay a certain amount for every 1,000 people that see your ad. Make sure you still stay within the suggested bid range.